Inventory We are a resale marketplace, not a box office or venue. Ticket prices may exceed face value. This site is not owned by Curran Theater . The Curran Theatre in San Francisco has been operating since 1922 and is one of the most well known theaters in the world. 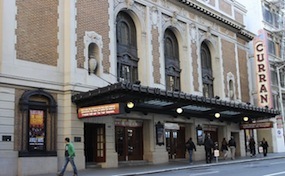 The Curran Theatre box office is located on 445 Geary in downtown San Francisco and has a current seating capacity of 1,667. The Curran Theatre hosts the most well known traveling Broadway shows along with other plays that pass through the area. Some of the most well received Curran Theatre tickets have included shows like Wicked, Jersey Boys, Les Miserables, The Phantom of the Opera, A Chorus Line, and more. Some of the biggest names in theatre have performed here like Al Pacino, Jack Lemmon, James Earl Jones, Lenny Bruce, Matthew Broderick, Carol Channing, Florence Henderson, Angela Lansbury, and more. Curran.TheatreSanFrancisco.com is not currently affiliated with any official supplier, website, or box office. We proudly offer access to exclusive inventory for all secondary market events. Prices will fluctuate with the market and can be below or above face value. To order tickets for all Curran Theatre events either follow the steps online by clicking on the event of interest or pick up the phone and call our operators at anytime for more assistance.